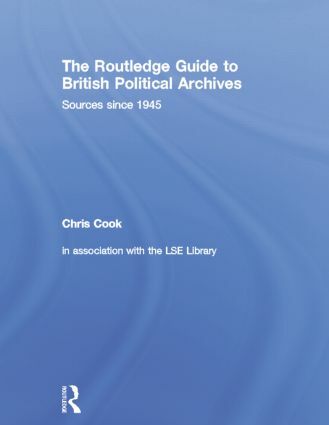 This major new reference work provides an authoritative and wide-ranging guide to archive sources now becoming available for British political history since 1945. With a user-friendly layout, the book presents a comprehensive range of 1,500 personal papers from leading statesmen, backbench politicians, writers, campaigners, diplomats and generals which cover the key aspects of British history since of the end of the Second World War. Compiled by an experienced archivist, this comprehensive, easy-to-use and authoritative guide is an invaluable resource for researchers of modern British history. Chris Cook is former Head of the Modern Archives Unit at the London School of Economics. Editor of the best-selling Pears Cyclopaedia for over thirty years, his is also author of The Routledge Companion to European History since 1763, The Routledge Companion to World History since 1914 and The Routledge Companion to Britain in the 19th Century.